Time: Sunday the 19th of June, 19:00 hour. Place: The Alonissos Museum in Patitiri, Alonissos. 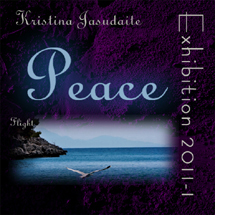 Event: the official opening of the photo exhibition "PEACE" of the Lithuanian photographer Kristina Jasudaite. Kristina means that: "It is not only a place which gives peace, it is also nature, which has a very loving, tranquilizing and revitalizing energy ( like Alonissos island in Greece). Peace is also people from various parts of the world (especially kids), connected with their true nature, vibrating with peace, being in touch with their souls, being satisfied with what they have and what they don't have, being connected to GOD". A lot of people showed up on the opening night of the exhibition and (as the slide show underneath proves) they had a really good time with photographs, conversation, snacks, drinks and live music. In this way 2011 started with a successful, interesting exhibition.